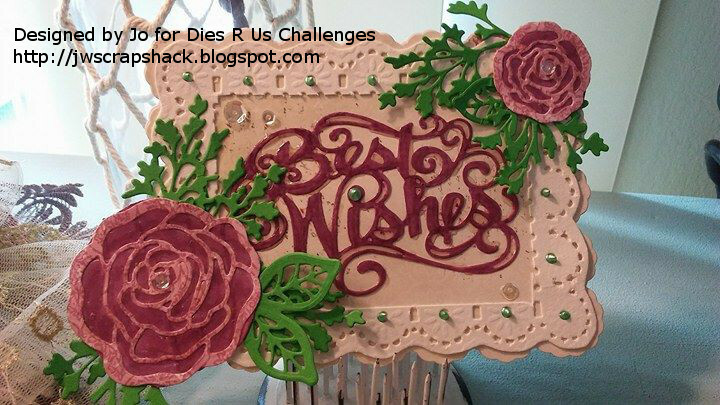 ~Jo's Scrap Shack~: Challenge #73 with Dies R Us! 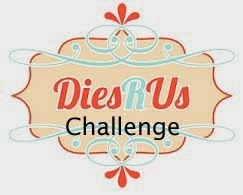 Challenge #73 with Dies R Us! Welcome to a new mid-month challenge at Dies R US! Our challenge today is all about shaped cards! We want to see all the many different ways you can create a card, but not in the traditional square or rectangle shape~. The design team and I, have some awesome projects to inspire you and help you create some shaped card projects. My Card is a normal A2 in size and I used Stampin' Up cardstock and My Besties paper. 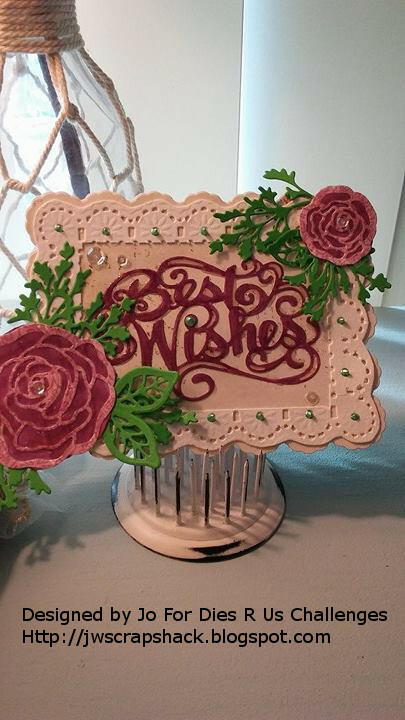 For the shape of my card and the scalloped layer, I used Spellbinders- A2 Floral Ribbon Threader Dies. Love these dies because there are so many ways you can use them. 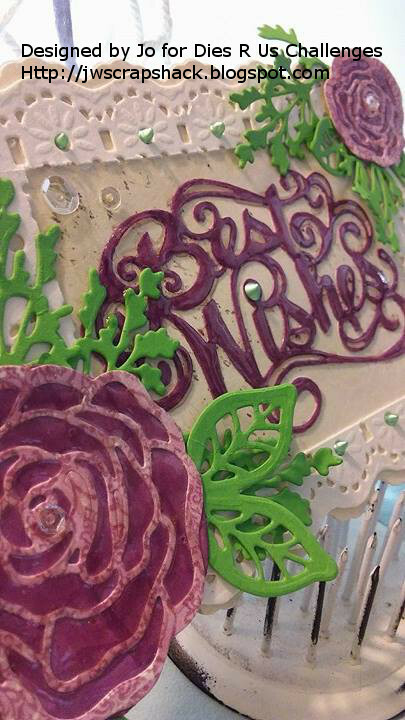 I cut out some beautiful roses from the Sue Wilson Designs- Finishing Touches Blushing Rose Dies. I colored up the backing layer of the rose with a copic marker. 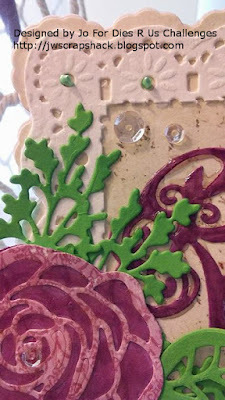 Once I knew the placement of where I would put the roses, I cut out some gorgeous green ferns from the Sue Wilson Designs- Finishing Touches Maidenhair Fern Dies. Love these ferns! I had to trim a couple of them down a little bit shorter but they still look great. I started to adhere everything in place. Once they were in place, I cut out the sentiment using the Sue Wilson Designs- Expressions Best Wishes Die. I colored this sentiment up using the same copic as I did with the roses. To finish up the card, I added some glossy accents to the roses and sentiment. Added in a few clear sequins and used some liquid pearls around the front scalloped layer because it needed a little extra something. All of the dies that I used are highlighted in the links above and can be found in the Dies R Us store HERE. WOW! So Pretty & Elegant JO... LOVE the shape... Have a great day! Gorgeous and elegant card!! You did an awesome job! How stunning! What a beautiful design! WOW! Stunning my friend!! I love the beautiful roses!! Very elegant! Love shaped cards!! You did an awesome job my friend!! Jo, this is absolutely stunning!!! I love the color scheme and the dies are so gorgeous! The design is incredible and you worked these dies to perfection to come up with such a beautiful creation!! So beautiful my friend! I hope you are having a nice spring~It's been a real rainy spring which for now is okay as I wouldn't have much time to enjoy it anyway. I have been spending a lot of time on the road going back and forth home. All my spare time is enjoying time with our grandkids and especially with our newest grandson, Oliver. Oh, he is so adorable and just can't get enough of him! thinking of you and hope you are doing good and feeling well my friend!